You may be thinking, “Doug, you’re crazy. I haven’t overlooked a pipeline, it’s central to our CRM!” And while the vast majority of companies that I see do have stated deal/opportunity stages that define their pipeline; more than 90% of them aren’t worth the paper (or bytes) they’re written on. Not only do they fail to create any real value or insight, they are central to the problems that sales and demand generation organizations are working so hard to overcome. This post will walk you through the key elements of designing an effective sales pipeline structure, as well as enabling you to diagnose some of the fundamental flaws that likely exist in your existing process. 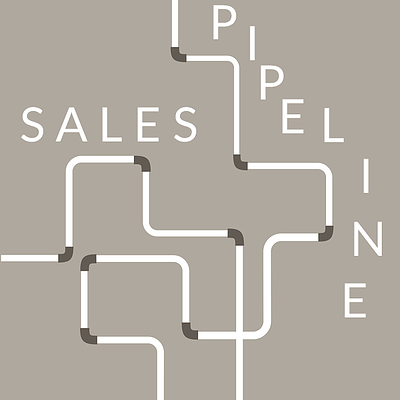 The sales pipeline is an interesting business discipline. Nearly everyone agrees business must have them, and they’re often treated with reverence & fear. (“It’s time for the pipeline review everyone!”) Yet, few executives I talk with (and even fewer sales reps) feel they get much value from their pipeline efforts. Create order and focus where there would otherwise be chaos. Stop for a moment and give your pipeline management a grade on these three criteria. If you’re like most of the companies whose processes I’ve reviewed (and I’ve reviewed thousands) the grade is not very good. The majority of pipeline management systems get a failing grade. Why? Without a carefully constructed system, pipeline management often becomes about salespeople placating managers, managers attempting to show they’re on top of things to senior executives, and senior executives trying to pump up their perceived performance with their boards. What’s missing, and I cannot emphasize this enough, is the crucial importance of a strong, clear and disciplined pipeline structure and tracking process. When pipeline/deal stages are clear and meaningful, it creates alignment, order and insight as it’s designed to do. Demo. Present. Propose. Close. These are not stages, these are activities. A series of activities is not an effective means for designing a sales strategy or your pipeline structure. I credit Jeff Thull, author of Mastering the Complex Sale, with this observation. Complex sales is less about managing a sales process than it is about managing a decision process. This may sound counterintuitive, but if you’ve designed your customer acquisition or sales process to “close every sale,” you’ll be wasting time on clients who should be eliminated early on---which in turn means you won’t be prioritizing potential large accounts which are a good fit. Your pipeline should be oriented towards maximizing the probability of a good decision, in an efficient means that meets your economic model. I’ve conducted more pipeline reviews in my lifetime than I care to think about. Through the advisory and coaching work I do for clients, I’m able to talk to sales reps, before and after the pipeline review, to get their take on opportunities and how they manage opportunity reporting. I can state unequivocally that the dominant stimulus that determines the stage a rep places a deal in the pipeline is what the rep thinks will minimize any negativity from their manager. It guides the frequency with which they actually update a deal stage and the stage they place them. When you realize this, it’s no wonder that forecasting sales and revenue is such a mystery. Managing a sales pipeline is a lot like navigating a journey on the high seas. There’s certainty in where you start (though I should add that in sales, the beginning of the process has lost a lot of its certainty) and where you want to end up. Everything else is subject to the conditions you encounter en route. A strong pipeline structure is to a salesperson and/or sales executive what a navigational chart is to a sailor. Your pipeline is (or should be) a unique process to your business. (Don’t just take someone else’s you like.) Therefore, the manner of designing your pipeline is as unique as your business. That said, here are five steps that are common in all good approaches, and will get you to at least a good design. The first thing to do is pull all of the information for 5 - 10 opportunities that recently concluded. If you’re a new business and don’t have 5 - 10 examples, create 5 - 7 user stories telling the fictional story of a completed sales process. Be sure you mix losses in with the wins. What was the origin of the opportunity? What interactions occurred before the opportunity became a sales qualified lead (SQL) and/or deal and entered your pipeline? Build out a timeline of all activities that occurred during the sales process. What assumptions/expectations turned out to be false? Don’t limit these observations to the thing you thought were true and turned out to be false, include the “positive” surprises as well. Who was involved on the buyer side? When did their involvement begin? When did it end? Now do the same on the seller side. What challenges did you face? When did you think the sale was certain, yet it hit a wall? When did you think the sale was lost, only to come back to life? Break the examples into the wins and the losses. Now compare the answers for the two groups. *What worked for both groups? What didn’t work for both groups? What was different between the groups? What worked for the wins that didn’t for the losses? What didn’t work that’s different between the two groups? Now create your narrative. If you had everything to do over again (which you will when the next opportunity comes along) what would you do differently to increase the likelihood of the wins? What would either decrease the likelihood of the loss or identify the losses earlier, so you can exit having invested less time, energy and money? Now create 3 - 5 user stories that describe common opportunities that present themselves. Using those stories as a guide, recreate the activities and path you’d follow to implement your discoveries from step two. Remember your goal is to enable both parties to make a good decision as early and effortlessly as possible. Those activities/actions/decisions that happen (or should happen) in a defined progression. Those activities/actions/decisions that need to happen, but can happen anywhere in the decision/sales process. For the activities you list, notate which activities/actions/decisions are crucial for success or which are nice to have. Determining the action to take and if/who to buy from. Does each stage, as it’s laid out progressively, increase the likelihood of a successful outcome and justify the additional time, energy and money to be invested? Does the same strategy, decisions and actions taken by the sales team apply to all opportunities that would fall at this stage? When you’re able to answer “yes” to both questions for every stage, you’ve arrived at the right number of stages. It’s been said that great communication is communicating so that you can’t be misunderstood, rather than communicating so that you can be understood. The same advice is true for pipeline design. Don’t just throw the stages into your CRM and call your work done. Be sure to define each stage clearly by ensuring these three elements are present for every stage. What’s the job that needs to be done? Why does this stage exist? How does someone know when the stage is completed successfully? Describing what’s happening at each stage is the next part of clearly communicating the process. What is the sales rep doing? What tools is the sales rep using? What else may be happening? The toughest change in sales over the last decade is that today the buyer and seller are often totally out of synch. The Zero Moment of Truth (ZMOT) has created a parallel, do-it-yourself path for the buyer in even the most complex sales, and even when a buyer is actively engaged with a seller. The mistake salespeople commonly make is that they determine where a prospect is in the buying journey by identifying the attribute that is closest to the end of the process. (There’s a psychological reason for this, but that’s a story for another blog post.) For example, if the prospect asks about pricing, terms or something similar, the seller naturally assumes the prospect is at the end of the process (after all, we talk price last) and treats them accordingly. This leads to steps, actions and decisions being skipped and not only decreases the predictability of the outcome, it also increases the decision reluctance felt by the buyer. A strong pipeline process establishes exit criteria for each stage, and an opportunity can only move to a progressive stage when all exit criteria of a previous stage are met. This approach allows the salesperson to engage with a buyer in alignment with where they are, while also eliminating the likelihood that steps are skipped. For example, let’s say we’re involved in a seven-stage sales process. The prospect shows a willingness to allocate the budget required for the sales (criteria typically associated in stage six in this mythical process), but we haven’t clearly defined the underlying problem that the buyer wants to solve (criteria typically associated with stage three). Most reps would mistakenly identify the opportunity as stage six and treat the prospect as though they’re about ready to make a decision. So, they’d rush to create a proposal, and then they’d confront myriad objections, hidden decision-makers, and more. With strong exit criteria, this opportunity would be assigned to stage three and the rep would clearly see that they need to focus on defining the problem to keep the process moving forward. Here’s an example of the overview page of our sales process to highlight what these three criteria look like. Greater predictability and higher win rates are not only possible but probable when you spend the time upfront to clearly design and document your sales process. While this process can take days and even weeks, don’t be deterred; you’ll discover that your salespeople will be empowered to prioritize the prospective customers who are the best “fit.” Even better, each stage of the pipeline will be completed properly--no more rushing the process due to arbitrary requests! If you follow these guidelines, we feel confident that you’ll see a strong payoff in your sales pipeline results.